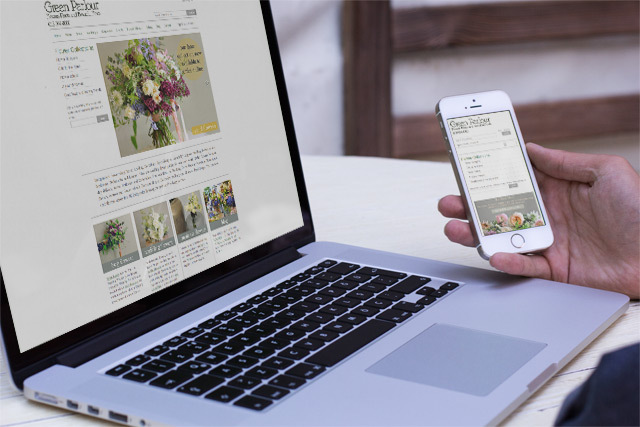 Last week we launched Pangbourne-based florist Green Parlour into the mobile era with a new website. Visually, the new greenparlour.com isn't a big leap onwards from the old greenparlour.com, but under the bonnet this website is completely different - the old site was built on a proprietorial ecommerce platform while the new site is fully converted to Wordpress using Woocommerce for the all-important shopping basket system and the Worldpay payment gateway extension for payment processing. An extensive modification of the free and flexible Wordpress twentyfifteen theme, the whole site is made mobile-friendly using Bootstrap so that it looks good and, most importantly, functions perfectly, on anything from a high-res desktop computer to the smallest screen mobile. This conversion isn't just about bringing the technology up to the latest industry standard - it's really about setting it free from its shackles. Thanks to our work, Green Parlour's highly creative lead florist Emma Sampson can now take charge of her own website in a way that had always been frustratingly difficult or impossible before. Using the universally-recognised tools provided by Wordpress, Emma is already bringing her vision for the site direct to Green Parlour customers without relying on third parties to unlock the mysteries of her own website. Green Parlour supplies a range of freshly-made bouquets for any occasion which can be delivered same-day in the Reading area for only £5 or nationwide for just £10. Of course, their wedding floristry service is second to none, as you might expect from a firm who were honoured to be one of those invited to provide floristry services for the Royal Wedding of Prince William and Catherine Middleton in 2011. But despite their pedigree, Green Parlour prides itself on offering reasonable prices for their services. Bouquets start from just £25 and local businesses can receive a fresh delivery of Green Parlour flowers every week for as little as £25 per week, invoiced monthly. See the Areas We Cover page if you'd like to find out if your location is eligible. Whether you need flowers for your office reception desk, the counter at a hair salon, the lobby of a hotel or artfully arranged in the windows of your pub or restaurant, Green Parlour can supply long-lasting and beautiful flowers and plants for your business, matching the best quality London florists, but at Berkshire prices. Find out more about Green Parlour Florists Reading by visiting their website or calling 0118 984 4000.